One fine day, I decided to catch up with my friend from high school, Matt whom I have not met in a long time. We decided to catch up for some coffee and cake at Foam Coffee Bar in Leederville. When I arrived at Foam, my usual indecisive me could not decide which of the lovely cakes that I should order. I must admit that all of the cakes do look very tempting indeed. Both of us ordered the mocha. Matt thought that the mocha was just average. What was interesting was that adding some hundreds and thousands on top of the mocha makes it stand out from other mochas that I had. I have never seen sprinkles added on top of the mocha before. But I must admit that having a mocha on a beautiful day and seeing those sprinkles definitely made me feel happy. Matt had the smoked salmon sandwich and I had a bit of a taste test of it. 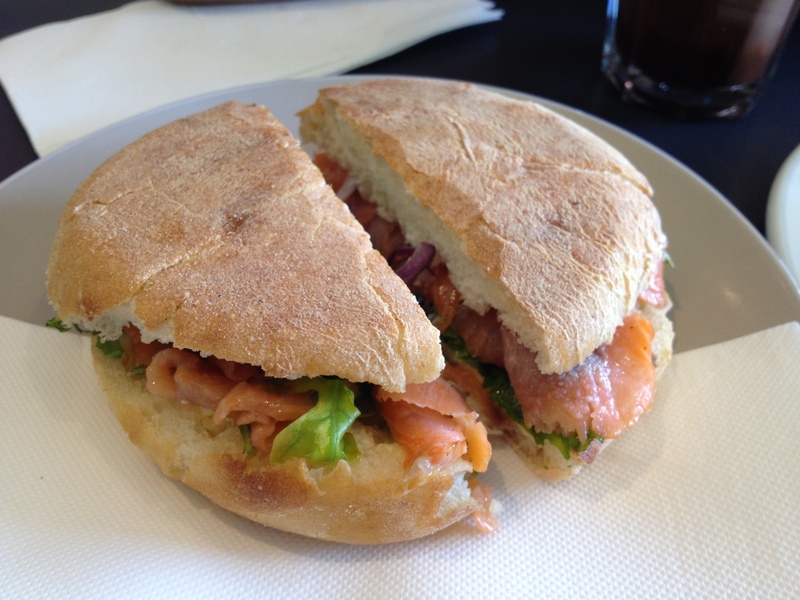 The smoked salmon sandwich makes a perfect grab and go lunch if you are in a hurry. Paired it with your coffee and your day will run smoothly. The smoked salmon was fresh making it a healthy choice and a good afternoon snack too. Although Matt did also mentioned that he could do with more greens or fresh vegetables. Otherwise, all was good. So, how did I decide which cake to get in the end? I chose the Carrot Cake just because from my observations, there were not many left so it must be popular among Foam’s customers. Matt tried a little bit of the carrot cake too. According to Matt, it was not too sweet, which I agreed. 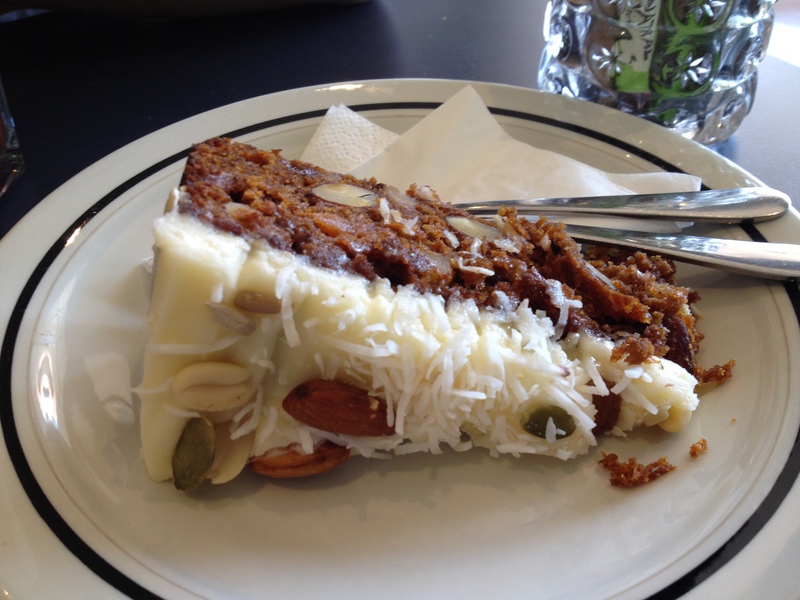 The carrot cake was soft and fluffy and had a few nuts around giving it an additional crunch. It was a good carrot cake. Although I was only there for coffee and cake, I think I will definitely go back to Foam one day for breakfast, lunch or brunch. I would really love to try some of their food there from looking at the menu. I’ve been meaning to try out this place! 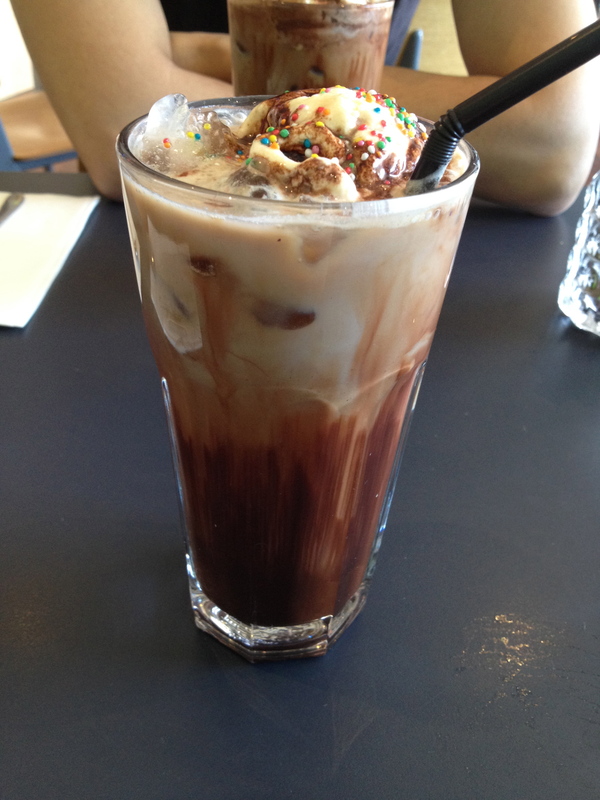 A mocha with rainbow sprinkles sure is inventive!